Tandem skydive over beautiful Busselton in the Margaret River Region from 8,000ft and enjoy 20 seconds free fall time. Tandem skydive over beautiful Busselton in the Margaret River Region from 10,000ft and enjoy 30 seconds free fall time. 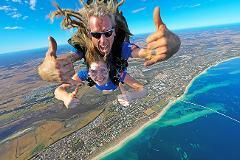 Tandem skydive over beautiful Busselton in the Margaret River Region from 14,000ft. This is our most popular altitude choice, giving you 60 seconds of exhilarating free fall time! Tandem skydive over beautiful Busselton in the Margaret River Region from 15,000ft and enjoy 66 seconds free fall time. This is the highest legal altitude to jump from in Australia!